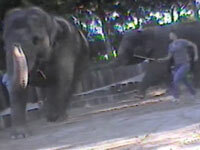 Video released in March 2011 by ADI showing elephants owned by US performing animal supplier Have Trunk Will Trunk being beaten and electric-shocked during training shocked the world and led to a lawsuit and an ongoing campaign by ADI to end elephant rides offered by the company at county fairs and other events across California. ADI joined forces with Put an End to Animal Cruelty and Exploitation (PEACE) and Loomus to oppose the use of Vana Mana - one of three elephants who ADI exposed being chained and beaten whilst performing at the Great British Circus - in movie The 100 Year Old Man when it premiered in Japan on November 8th and Estonia on December 12th. Video released by ADI showed the elephant that appears alongside Reese Witherspoon and Robert Pattinson in the film Water for Elephants, being beaten and electric-shocked during training. In the film Rosie, played by Tai, is brutally attacked by the circus owner who beats her with a bull hook. But the producers, stars, and trainers were at pains to stress that Tai was trained with kindness, marshmallows, and positive reinforcement. ADI called on members of the public to boycott the movie Zookeeper, after it was revealed that one of its animal stars Rosie the elephant was trained by Have Trunk Will Travel using violent methods. ADI has also blasted the makers of Rock of Ages (baboon) The Hangover (tiger), Night in the Museum (capuchin) and Knight and Day (running of the bulls) for their use of animals. 30 Seconds to Mars used a menagerie of animals – including a lion, wolf and zebra – in their music video for “Up in the Air” which were supplied by Good Dog Animals in California. George Michael used a zebra, as well as birds, from Amazing Animals in his music video for ‘White Light’. The Flaming Lips used a capuchin monkey and a frog in their music video for “You Lust”.